"Dance is a little insanity that does us all a lot of good." SPECIAL DISCOUNT $36 Both workshops!!! Click HERE for Retroglide, or call 818 753 0054 to register. Our special guest Rhythm Pal for the afternoon is Ryan Roemer. You've seen him Charleston with Rusty at the Rhythm Club, but now here's your chance to see what he's got to share! It's been over three years since we did our last Taste of Dance. So mark your calendars for this one! How many times have you had to leave the dance floor when a Mambo came on? How many times have you dreamed of dancing with that great Salsa dancer? 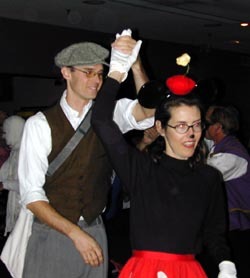 What about those fabulous Lindy Hop character steps, such as the Minne Dip, Johnnie's Drop, Groucho? Do you leave the floor when everyone else runs on to do the Shim Sham? Well, here it is -- A Taste of Dance! One full day dedicated to getting you on the dance floor all night. 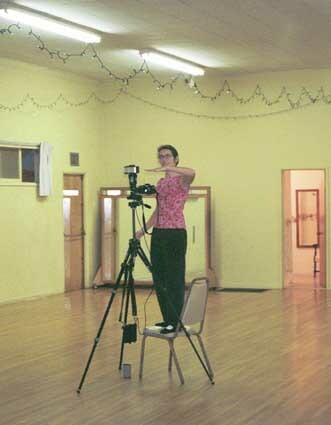 We�re offering 50-minute classes in a wonderful array of dances from which to choose. Take the entire day, or just sample four of your choice, or maybe there's one or two for which you've got time. it's up to you. All we ask is that you ENJOY! And feast to your heart's content! FEATURED CLASS -- COLLEGIATE SHAG! FEBRUARY SERIES: The February series has begun, and it's NOT TO LATE TO JOIN!. Check out our schedule for dates and times HERE. 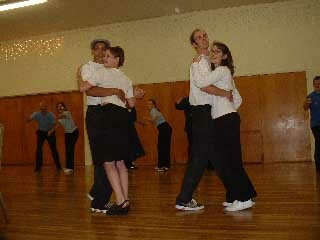 MORE BEGINNERS: For all of you "seasoned" swing dancers, you know how important it is to constantly bring in new people. If you know anyone at work or in your social circles who has been making noises about wanting to learn -- why not give them that "gentle shove" into class or on the dance floor. Without beginners, we won't have people to dance with in the future! The first rehearsal of the Swing Shift Flyers was held last Sunday, and - WOW! - what a troupe! Twenty-eight truly wonderful lindy hoppers joined the Swing Shift Flyers - Rusty's new amateur lindy hop troupe. They began working on their first routine -- "Jeep Jockey Jump" (choreography by Rusty & Peter, Erik and Sylvia). Wait till you see 'em.... phew! JONATHAN STOUT AND HIS CAMPUS FIVE FEATURING HILARY ALEXANDER: We are thrilled to be bringing back for the third time this fabulous ensemble... If you want to see and read more about them click HERE. This new group has quickly taken Los Angeles and all of Southern California by storm. And we hear that their brand new cd, "Jammin' the Blues," will be ready in about a week. So save your pennies! BEGINNER'S SWING CLASS. That's right, it's the first Wednesday of the month, and we have a swing dance class to start off the evening from 7:30-8:00. Rusty will be join by her Rhythm Pal, Giovanni. If you haven't met him yet, or want to cheer him on, here's your chance. This class is also a great chance to expose people to the joy of swing dancing! GOOD-BYE TO SCOTT AND CHERYLL. 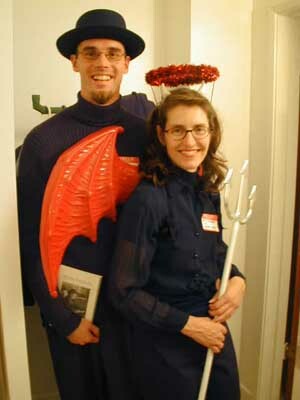 Two of Lindy By The Sea's oldest and dearest friends, Scott and Cheryll, are moving to the East Coast. They have been regulars on our South Bay scene for over four years! We want to have a VERY special going away dance for them this week at the club, as it will probably be their last dance with us (though, they have assured us of regular visits). So come along this week for your last chance to dance with Scott and Cheryll and wish them well. I (Rusty) would also like to thank both of them for all their contributions throughout the year to our Lindy By The Sea family. Just to mention a few things: They created all the decorations for our first Halloween Party, Cheryll took our first big group picture at the one-year anniversary party, they put up all the beautiful lights in the Neptunian Woman's Club that we use for the End-of-Series Party. They're quiet, but their presence is known! We'll really miss you two. We know it will be a great experience back East, and you'll be able to dance like crazy there, but you will be missed here. Love from all of us. Just wanted to give you an update on the adventures of Scott and Cheryll. Yes, we are still moving to NYC. Scott will be working for a company called Sirius Satellite Radio Company, still doing satellite engineering work. He got an offer from the company over the holidays, we looked at it, crunched some numbers, did conversions and it's just a great opportunity to work and live in NYC and take advantage of the millions of things to do there. We'll be looking for a place in Brooklyn (Brooklyn Heights, Park Slope, the upper west side of the borough) and I'll look for work when I get there. Needless to say, it's all come down a bit fast. Scott and I will be leaving February 14th. We've been gradually tying things up, getting things done, cleaning, setting things up, visiting with friends and family before we go, but February will definitely be a crunch for us. 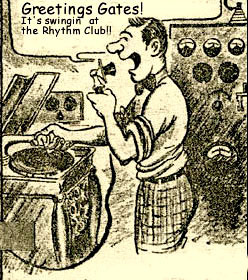 Therefore, our last (sure) visit to the Rhythm Club, before we're off, will be February 5th. If you could put that word out to our fellow swing friends, that would be great. We'd love to get a dance in with as many of our dancing friends as possible before we leave. Also, if you wouldn't mind, could you please pass on our e mail information to anyone who'd like to keep in touch with us? Cheryll's e mail: ca@lynn.net ; Scott's e mail: freddevil@earthlink.net . Instead of trying to collect (and possibly loose) friends contact information, we hope that anyone who'd like to keep in touch with us (or come visit us) can drop us a quick e mail. We're both very excited about the change and all of the wonderful things that it will bring. I truly look at it as I'm "going to New York City", not as I'm "leaving LA and California". My folks are permanently rooted in Manhattan Beach (41+ years!) and both Scott and myself really do love California, so don't ever think you've seen the last of us. But now, we're off on our New York adventure, ready to embrace and love all the best that NYC and the East coast has to offer. And yes, I know it was 8 degrees F and snowing the other day. AND SPECIAL ADDED ATTRACTION -- THE RHYTHM HOT SHOTS FROM SWEDEN! We guess it pays to have friends in high places. 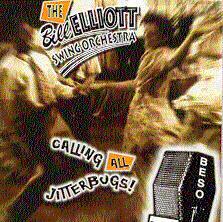 And you can't go much higher in our swing world than the Bill Elliott Swing Orchestra. 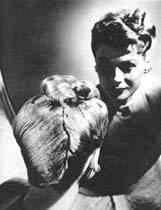 So guess which one of Rusty's Rhythm Pals is going to be playing on her birthday at the Rhythm Club? Okay, not much of a surprise -- but, wow! what a coup. Yes, indeed, and hi-de-ho, The Bill Elliott Swing Orchestra. Make room dancers, because this is going to be a night for the books. Mark your calendars -- that's Wednesday, February 26th 2003. If you haven't gotten your copy yet, rush to the newstands and purchase this month's LA Magazine. Their headline article is entitled: "GET UP AND DANCE". 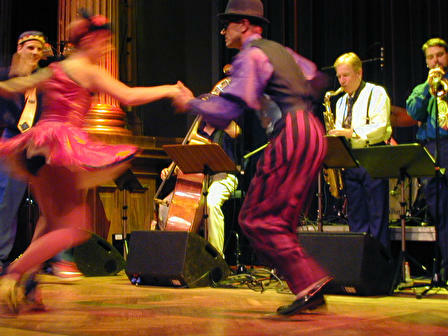 All dances are featured from swing to salsa, from hip-hop to hula. And you'll surely recognize LA's swing kids Tise and Nick! They get a full page photograph on page 58. Congrats, kids. Our student, Nancy wrote the following letter -- which is a great compliment to all of us in Lindy By The Sea -- thanks Nancy! Tami and Erin Stevens don't just teach ballroom. The Stevens sisters teach several weekly large Lindy-Hop and East-Coast Swing classes at "Pasadena Ballroom Dance Association". There is no more lovely way to melt-away the week's stresses, than to learn moves to big band music on Saturday mornings! Saturday evening PBDA dances with live big-band music are likewise enjoyable, always including dance activities that require no previous experience. On the Westside, Rusty teaches similar, particularly friendly,large classes at "Lindy by the Sea" in Manhattan Beach on Sunday afternoons, and invites all to "The Rhythm Club" on Wednesday evenings in Playa del Rey, again to dance to live big-band music. 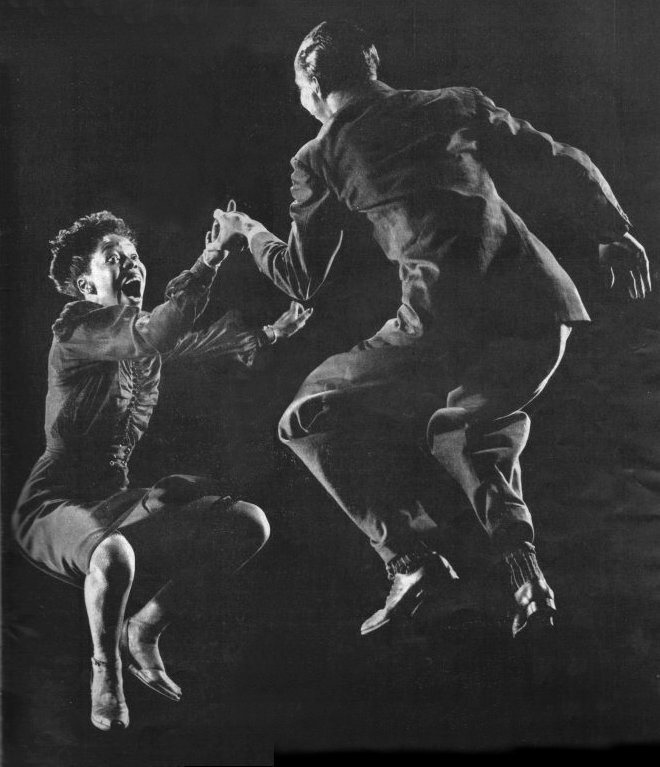 PBDA and Lindy-by-the-Sea make large contributions to the swing dance world in L.A. My intention is that your readership should be aware of less-pretentious, less expensive opportunities to learn dance if they are so inclined. I'd love to see more swing and ballroom dancers in the city, and look forward to new and return of more venues for magnificent evenings. 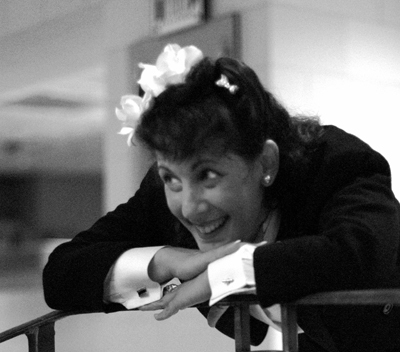 If any of you would like to have a private swing dance lesson, give Rusty a call at 310.606.5606. LOS ANGELES CONSERVANCY. Some of you are already members, some of you may have never heard of it. But the Los Angeles Conservancy is one of Southern California's best kept secrets. If you love the culture of swing, not just because of the music and dancing, but also the other aspects of the 1920's-40's, well, this organization might be something for you. Not only do they put on the incredible Last Remaining Seats Festival every summer, they also conduct walking tours of Los Angeles' historic theatres, art deco districts, etc. Why not get out in the day light for one of these wonderful tours!